Can a pill be as efficient as a gastric band surgery? The Gastric Band Pill claims so. Clinico is a UK-based company specializing in herbal health and fitness supplements. One of their herbal products is the Gastric Band Pill claiming to have a record of over 100,000 satisfied customers. The gastric band pill helps people lose weight by suppressing your appetite and reducing the frequency of hunger pangs. The main action of Clinico’s Gastric Band tablets is decreasing your appetite and fast-forwarding fat burning processes by boosting how efficiently you metabolize energy and fat. Unsolicited testimonials on official site, no way of cross-checking validity or authenticity of claims. No photo evidence available either. How does the Gastric Band Pill work? There’s scarce information as to the exact processes that take place and allow people to lose weight by taking the Gastric Band diet pills. The only insights we get from the official Clinico site is that it achieves two things, appetite suppression and fat melting acceleration. This is a mystery pill. The developing company, Clinico, asserts the pill contains herbal elements and medicinal plants but makes no effort to present these ingredients to consumers. 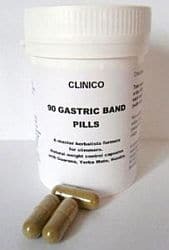 Although not confirmed, Clinico’s Gastric Band contains among other trace elements and minerals, hoodia, Yerba Mate and Guarana. Ingredients and herbs commonly found in diet pills. Since there’s no way of evaluating the ingredients in the Gastric Band diet formula, it cannot be said with certainty whether you will experience any side effects when taking it. Despite the fact that it might contain hoodia and guarana, we cannot verify the quality and quantity of these ingredients and whether they are sufficient doses or toxic and harmful ones. Given that the this slimming tablet contains guarana, a caffeine-based herb, it is expected that those with caffeine sensitivity might experience a sleep disturbance and other stimulant-provoked side effects like restlessness and jitters. The Gastric Band pill seems like a bad investment. There are safer and more promising weight loss solutions out there. The lack of ingredient disclosure, clinical evidence and independent, customer feedback are red flags warning you to keep away from it. If you want to lose weight in a way that doesn’t put yourself in danger and will give you a slimmer, more confident body you can try Garcinia Cambogia Extra. There are many reasons why you should try Garcinia Cambogia Extra, we provide the top ones. Garcinia Cambogia — the plant not the supplement — has been featured and endorsed by Dr. Oz., a global opinion leader. Ingredients used are clinically tested for their weight loss power and safety of use. Garcinia Extra prides itself in being a top choice for many celebrities and hundreds of satisfied customers who got slimmer and more confident by choosing Garcinia Cambogia as part of their new lifestyle. Lastly, Garcinia Extra is on a 100% money back guarantee to ensure customer peace of mind.